Makeup by Keri Ann: Makeup Tip #23 - Where are your products from? Makeup Tip #23 - Where are your products from? I was recently on a mission to find eye shadow colors for a client who desired a certain color pallet. I also wanted to use matte shadows, so I purchased a few items I thought would work. While putting some items back in my makeup bags, I turned over one of the pallets I purchased. 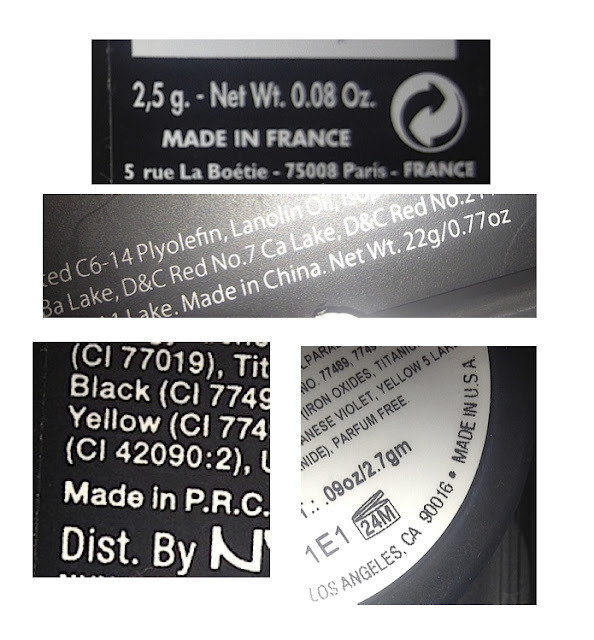 I noticed that the pallet did not list where the product was made, only the country that distributes the makeup. I've learned from reading food and clothing labels, when the label says "distributed by..." and not "made by", it usually means products are not made here in the United States. However, the only way to verify where a product is made is to call the company brand directly and inquire about the specific product in question. 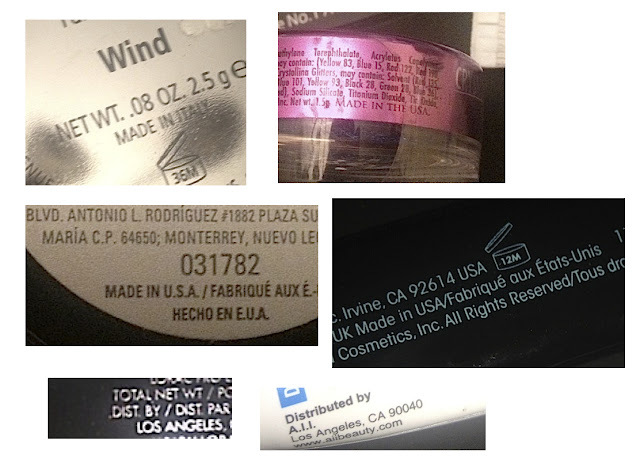 Once I noticed the "distributed by" label, I began reading the labels on all of my products. I wasn't surprised to find cosmetics made in Europe, as the Europeans are famous for clothes, perfumes & cosmetics. However, I was surprised to find that several were made in the PRC, or the People's Republic of China. Thankfully, I did find some brands in my bag that were manufactured right here in the good old U.S.A. It's amazing to me how many products America actually imports. I always knew clothing & household items were imported, but I have learned to be especially careful to read labels on candy and other food items, as they are also being imported. I am dismayed that I have to start reading the labels on all the makeup I buy too! We Americans love to flaunt our brand names and many of those brands have found ways to produce greater quantities without cutting into their profit margins. Be a wise shopper and do your homework. Decide what qualities in a product are most important to you and then try to patronize brands that share your values. As a makeup artist, I am committed to make sure I use high quality products on my clients and I am committed to pay more attention to the back of the product packaging instead of the brand name on the box. I hope this little bit of information will help you become a more informed consumer as well. For more information, please contact me at info@makeupbykeriann.com OR leave a comment here!